Marco Rubio is an American politician. A Republican, he has served as a U.S. Senator from Florida, since January 3, 2011, and Chair of the Senate Small Business Committee, since January 3, 2019. He was previously a Speaker of the Florida House of Representatives, from November 21, 2006 to November 18, 2008. Marco is the son of Cuban-born parents, Oriales Garcia and Mario Rubio Reina. They moved to the United States in 1956, as economic migrants, while Fulgencio Batista was President of Cuba. 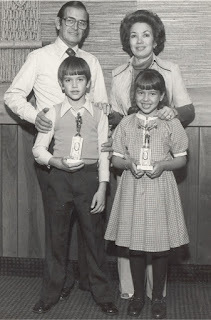 A childhood picture of Marco with his parents and sister can be seen here. Marco is married to Jeanette Dousdebes Rubio, with whom he has four children. Marco’s sister, photographer Veronica Rubio, was previously married to actor and singer Carlos Ponce. Marco’s matrilineal DNA line is Indigenous. Research by the show found that he descends from a landowning family that had been in Cuba since the 1700s, though recent generations of his family were working class. Marco’s paternal grandfather was Antonio Rubio Pazos (the son of Dionisio Rubio and Concepcion Pazos). Antonio was from Pinar del Río, Cuba. Marco’s paternal grandmother was Eloísa Reina y Sánchez (the daughter of Rafael Reina Salvadores and Maria Eloisa Sanchez y Otano). Eloísa was born in Havana, Cuba, to a Spanish father. Rafael was the son of Rafael Reina Sanchez and Maria de Los Nieves Salvadores. Marco’s maternal grandfather was Pedro Víctor García (the son of Carlos Pérez and Ramona García y León). Pedro was born in Santo Domingo, Las Villas, Cuba, to Spanish parents. Marco’s paternal grandmother was Dominga de la Caridad Rodriguez Chiroldes (the daughter of Nicolas Rodriguez and Beatrice Chiroldes). Dominga was born in Colón, Matanzas, Cuba. Marco is the second person of Hispanic ancestry to win a caucus and/or primary for a major American political party’s Presidential nomination. He won 3 contests in 2016. Ted Cruz, also in 2016, is the first person of Hispanic ancestry to win a major caucus and/or primary, with the Iowa caucuses being the first. So 3 of his 8 great-grandparents were born in Spain. 10-15 % amerindian , eyes, nose….mother doesnt look White.